Rev. Thomas Duke Harrison -- Part one. So now we have come to "The Duke". I remember when I first started tracing my tree, I was so proud to show my mother how far back I had traced on her line. I showed her I found John Thomas Harrison's father, Thomas Duke Harrison. She said, "Aha...I see you found The Duke." The way she said this gave me the impression that this wasn't someone you messed around with. She only knew of him from what her grandfather had told her. He was a serious man, religious and a true disciplinarian. Family lore says that the last name of the Harrison line was originally Dove, but later it was changed to Harrison. According to one family member, she stated that Thomas was part Cherokee and supposedly grew up on a reservation until he was a teenager. His mother was black and his father supposedly full Cherokee. I don't know how much of this is true. From my research, I suspect that the Native American blood he may have carried was actually Tuscaroran. Often those who had any Tuscaroran ties at the time Thomas Duke was growing up, they would say they were Cherokee, because the Cherokee were typically friendly to whites of the time. Tuscarorans were driven out of North Carolina after the Tuscaroran Indian War (1711--1715) those that stayed true to Tuscaroran ties moved to NY and reunited with their ancestral brothers of the Five Civilized Tribes and those that remained behind would claim to be white, black, mulatto, or Cherokee to avoid negative consequences. This I believe was the case with my mother's maternal line. My grandmother Mary Horton, always told me that her family line was part Cherokee. From the evidence I have gathered from the Taylor and Mitchell surnames that she descends from is that the Native American Heritage she comes from more than likely was either Tuscaroran or Coree. I have a feeling if what one of my family members says is true about Thomas Duke and his father, that perhaps they may have grown up around Lake Mattamuskett, NC in Hyde County. It is said that many of Native American descent were sent there to live out their days there after being driven out from their homeland or perhaps he was from Indian Woods in Bertie County, NC. Or maybe indeed he was part Cherokee. Have to keep digging here. The first census record that I believe shows "The Duke" is from 1880 in Rock Point, Pender County, NC. He is shown here at age 20, working as a servant in the household of a Benjamin and Mary Lee. There is also an Ella Dove listed below him who is also, a servant. Now the reason why I think this is my Duke Harrison is what I found when I located him on the 1900 Census in Wilmington. Here is the 1900 Census for Thomas Duke Harrison. He's located living in Wilmington Ward 5, New Hanover, NC. It turns out that Ella Dove who married a William Faison shows up living in the same part of town as Thomas Duke Harrison. Ella Dove Faison resided at 1007 Wooster St. until her death in 1929. 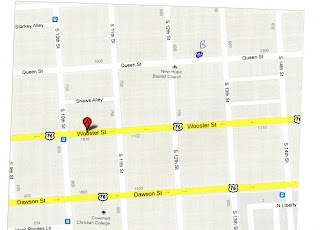 1007 Wooster St is marked as point A in the following map and according to the 1905 Hill's Co. City Directory for Wilmington. 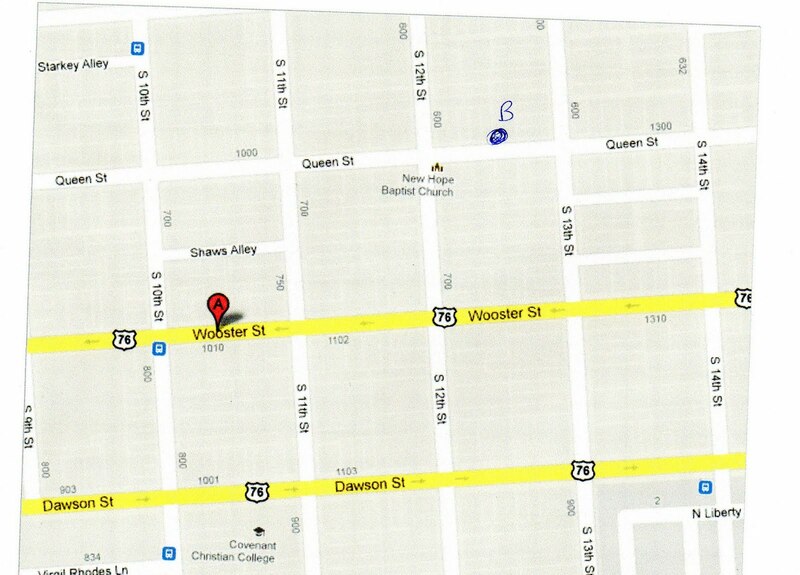 Thomas Duke and family resided at 1218 Queen St.. 1218 Queen St is marked approximately at point B. By 1910, the Harrisons were located a block away from Ella Faison at 908 Wooster. By 1920 the Harrisons had moved on to New Bern. Now it seems to be more than just a coincidence that Ella and Thomas wound up living in the same town and neighborhood. Perhaps they were related, perhaps they merely worked together in their youth. They were not siblings because on her death certificate it shows her parents names as Alex Dove and Mary E King both of Georgia. By the 1920 census you find the family in New Bern at 1510 Lincoln St. where Thomas resided until his death in 1940. The household of Thomas Duke Harrison looked like this. John Thomas Harrison (December 3, 1891--June 22, 1974) my great grandfather. More tomorrow. My eyeballs are about to fall out my head. Must take a break. Rev. Thomas Duke Harrison--Part two. And the Winner is ...An Empty Lot! Tombstone Tuesday: John Thomas Harrison Sr.
My Grandmother, A Woman Ahead Of Her Time?